Today marked the first big step of our adventure. After 3 months of research, watching videos, test rides, bike shows, conversations and disagreement, we finally collected the bikes that we both agreed were ideal for our trip. To say we were like two young lads getting their first ever bike is an understatement. 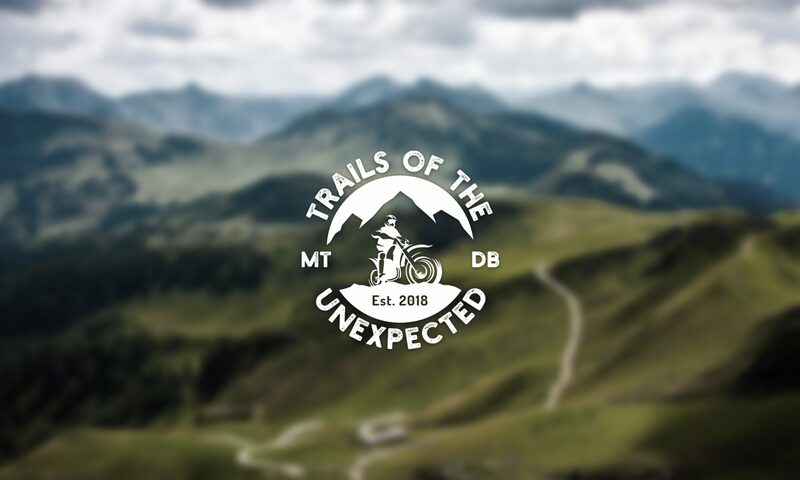 The excitement of getting a new bike always puts more than a smile on every biker’s face but for us it was more than that, it was about us taking the first big step into our adventure. Out of the blue came a bike that caught our imagination the moment we sat on it. The feeling of the long legged suspension, the feather weight, the ruggedness of design, the ground clearance, comfort and simplicity of function was everything we had been looking for and yet it had never made our list for consideration. How had we missed such a pearl? 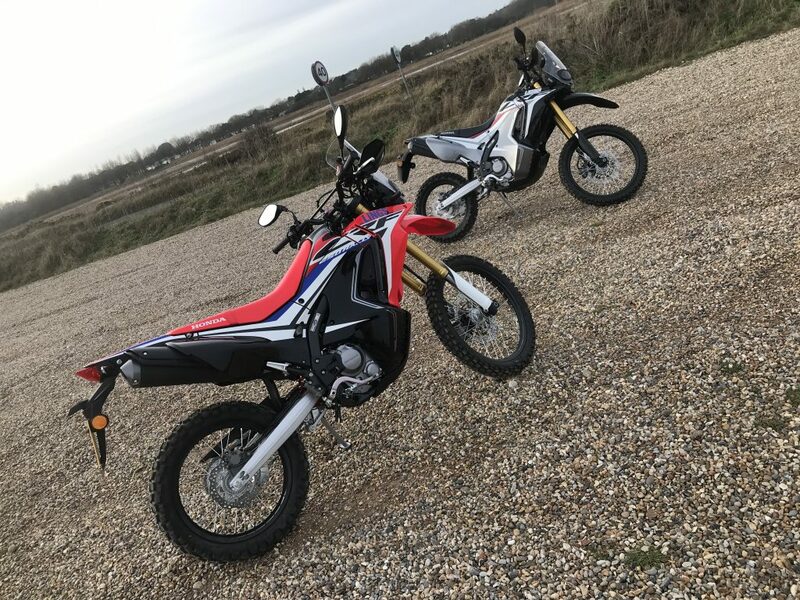 Honda have a long history of building trail and adventure bikes and with the launch of the new Africa Twin bringing such technology as DCT to the adventure bike market they have once again moved into one of the top spots in the sector. 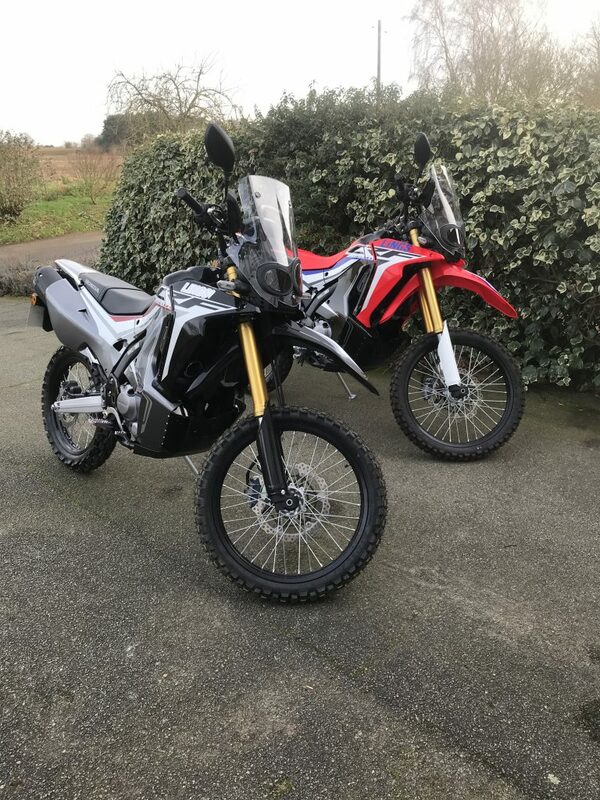 Unfortunately as much as we both loved riding the Africa Twin, especially the DCT model, it wasn’t within our budget, weight limits or Mike’s short legs. So we needed something smaller, lower and much lighter but just as functional and capable and that’s where the Honda CRF250 Rally comes in. Weighing in at 157KG this bike is light, its peppy little 250cc single cylinder engine only makes 25hp but it’s ample, torquey from way down low in the rev range but eager to please. The 6 speed transmission is a peach, no false neutrals, lovely clutchless changes and a good spread of gear ratios, everything we need and to top it off Mike can touch the ground, with both feet … at the same time! The bike comes with ABS as standard but the great thing is it can be turned off for off-road use with the press of a button, no hunting through menus, no selecting modes, no trying to find the right setting just a simple on/off button, just what us old boys love! So after parting with our hard earned cash, the signing of documents and shaking of hands we were finally on the road. Initially it was a bit of a shock, the bikes were so light, turned in so easily and the knobbly tyres so strange compared to what we’re used to but we persevered and soon found ourselves on the coast at Aldeburgh. Some 70 miles later the tyres had settled down and were much more confident on the wet salty roads, we’d both started to get to know the bikes and how they behaved, stopping frequently to chat with excitement in our voices. This is the beginning and it is good! 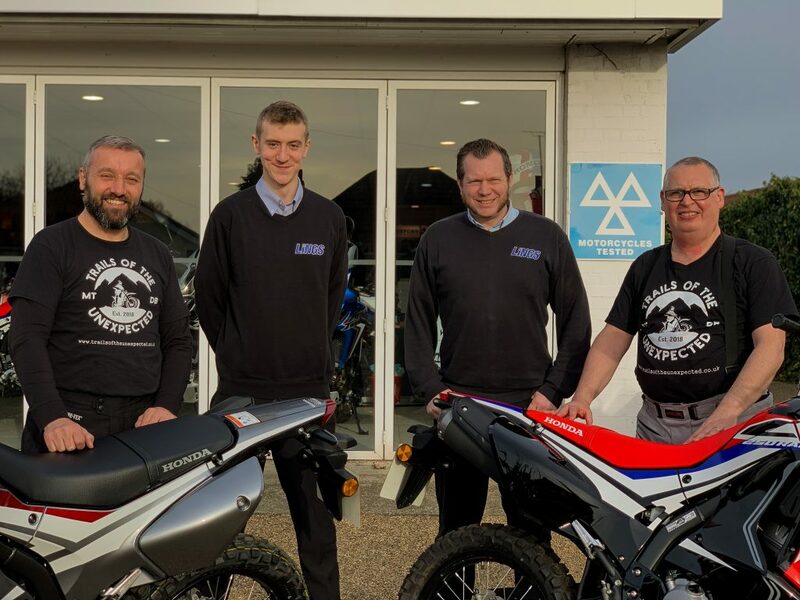 A huge thanks to Tom, Mark, Steph and Millie at Lings Ipswich for putting up with us, we’re not the easiest of customers and we know we go on a bit but this has been a big thing for us and it had to be right.